A new report from Brand Networks shows how rapidly the Internet environment changes, charting how Instagram has grown into a marketing behemoth in the space of just four years. 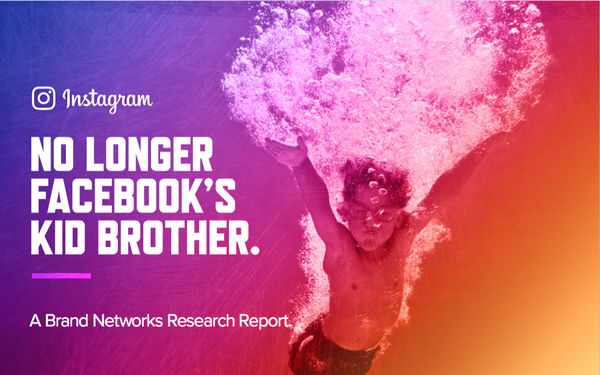 “No Longer Facebook’s Kid Brother,” says it all in the title. “What started as an artistic and visual forum for reaching a relatively niche audience has transformed into a platform with massive reach and appeal,” the report declares, noting how Instagram grew as video became a staple on the social media site. The ad company’s own experience can attest to that: “While Brand Networks served just 2 billion impressions in the first six months of Instagram advertising [in 2015] , that number jumped to 44 billion in the first 36 months; during that time, the average CPM dropped by 19.7%,” the report says. The new report seems to be as much a piece of advertising, as it is research, but given the numbers, it does provide an interesting snapshot — or perhaps the more apt metaphor is “short video” — of how Instagram has become a part of the advertising landscape. That is happening, Merkle noted, “despite all the negative attention the platforms have received” in 2018. In a chart that accompanies the Brand Network study, the company traces cost-per-thousand price changes in major sectors, showing Instagram is a popular and relatively efficient buy for advertisers. In all sectors except banking, the CPM is down, and video is the preferred way to go. “Advertisers delivering media against brand awareness objectives are embracing video as a medium for ad-based communication,” the report says. “In the first half of 2018, 73% of the total impressions served by CPG advertisers were video. For the Retail and Media & Entertainment industries, video accounted for 60% and 78% of total ad impressions, respectively." To consumers, the most immediate recent difference is Instagram's Stories feature — launched two years ago — and the fact that Instagram these days has far more videos than it did back then. This year, through June, video makes up 66.2% of the total ad impressions, the new report says, and in that same six-month time period, it served as many video ads as it did through all of 2017. In July of 2015, Instagram’s ad business was still in beta, reserved for a handful of ad-tech companies ,including Brand Networks. It had 400,000 monthly users. By June of this year, it had reached 1 billion monthly active users.